Owing to our rich industry experience, we have emerged as a successful Manufacturer, Supplier and Exporter of Board Gluing Machines. It is designed for gluing duplex board and thick paper. 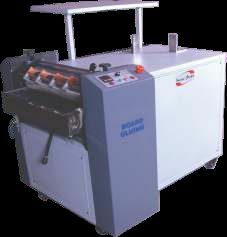 The Machine is compact and equipped with hot melt gluing system and stainless steel rollers. Our Machines is also used for back-to-back pasting of books. Bulk orders of the Machines are processed by us as per the specific requirements of the buyers.